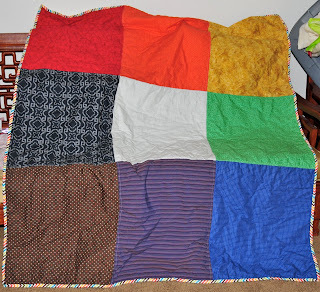 I finally finished my quilt for Craft Hope Project 13 on Monday. I don't know why it took me so long. I guess life just got kinda busy. I sent this out yesterday, as well as the bracelets from Project 12. I am pretty happy with how it turned out. I love that it was so simple to put together, and I love the rainbow colors. 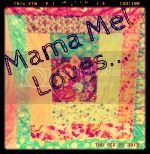 It would be a great quilt for a kids room! I think I'll have to make a similar one for us to keep here. 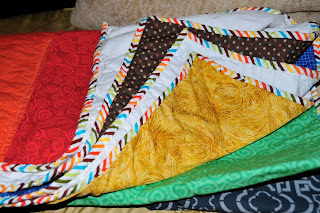 :) I did simple straight quilting just along the 1/4" seams of the blocks. I used Anne Kelle's Remix fabric in the Bermuda Zig Zag color. I love how that turned out too! It was the perfect rainbow-y choice for this quilt! I hope that this quilt puts a smile on the face of someone affected by those nasty tornadoes in the South.